The Canada 2006 Census day was May 16, 2006, followed by the Canada 2011 Census day on May 10, 2011. These figures do not include the substantial population living along the shores of the Fishing Lakes. The current site is the third Fort Qu'Appelle. The first was a North West Company trading post (1801–05), also in the valley but near what is now the Saskatchewan-Manitoba border. 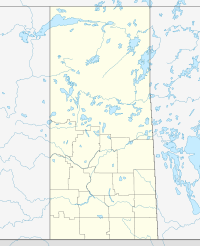 The Hudson's Bay Company itself first used the name for a post north of present-day Whitewood (some 174 kilometres east of Regina on Number 1 Highway) from 1813 to 1819. Prior to the mid-19th century establishment of the more lengthily surviving fur-trading post at the ultimate site of the town, it "was the hub of several historic trails that traversed the northwest". It was the site of a Hudson's Bay Company post from 1852 to 1854. An Anglican mission was established, which still survives as the town's St. John the Evangelist Anglican parish church. The post was revived again from 1864 to 1911. With the signing of Treaty 4 by Cree and Salteaux aboriginal peoples at Fort Qu'Appelle the North-West Mounted Police, now the RCMP, arrived[full citation needed] and have maintained a continuous presence in the town ever since. Substantial transformation of Fort Qu'Appelle occurred when farm development began in the 1880s and farmers required a nearby urban centre for selling their grain and other products, purchasing agricultural and domestic supplies and for social gathering beyond rural schools and churches. It was not anticipated that initial partition of agricultural land into farms of one-quarter section (250 acres) would not last long and farm population would substantially reduce very quickly; the process accelerated in the 1970s when farmers began selling their land and retiring in substantial numbers to Fort Qu'Appelle and the custom of elderly farmers remaining at home with offspring past into history, with more retiring to town. The name "Qu'Appelle" comes from "is French for 'who calls' and is derived from its Cree name, kah-tep-was ('river that calls'). There are several versions of the origin of this name, but the most popular suggests it refers to a Cree legend of two ill-fated lovers." The name refers to the once-popular legend of the Qu'Appelle Valley versified by Pauline Johnson and known nation-wide. "Fort Qu'Appelle was the crossroads of a number of historic trails that traversed the North-West Territories." Hudson's Bay post, pre-1914. Today a museum. The town is immediately adjacent to the site of the original Fort Qu'Appelle Hudson's Bay Company trading post, whose "factory" is maintained as a historical site and museum. The Hudson's Bay trading post was built in 1864 when the Company's activity was still largely confined to the fur trade with indigenous residents. "[P]emmican was shipped down valley on a Hudson's Bay Company cart trail to supply the paddlers of the fur trade in more forested regions." Despite the once well-known gathering of General Middleton and soldiers at Qu'Appelle, at the western-most extreme of the still-incomplete Canadian Pacific Railway and some kilometres south of the Qu'Appelle Valley, "[i] Middleton empowered Captain French, an Irish officer who had been in the North-West Mounted Police (NWMP), to raise a mounted force in the vicinity of Fort Qu’Appelle. ... This mounted troop ... joined the 10th Royal Grenadiers from Toronto and the Winnipeg Field Battery under the command of artillery officer Lieutenant-Colonel C.E. Montizambert, to form the west-bank column that would march from Qu’Appelle to Batoche", where the notorious battling would occur. After ethnic European settlement by farmers had become established in the 1880s—a post office being established in 1880—the original Hudson's Bay Company activity was replaced by its department store on Broadway Street in 1897. By this time the fur trade had lapsed but the town community and farmers travelling into town for shopping had substantially increased in number. The store building remains though long disused by the Bay. There was once certain ambiguity as to entitlement to the town-name between the present town and the once-significant regional centre bearing the name "Qu'Appelle"; the matter ceased to be an issue in 1911 when the two communities agreed to deem the then-CPR station site as Qu'Appelle and the town in the valley as Fort Qu'Appelle. As did the town of Qu'Appelle, Fort Qu'Appelle early-on had "a bid to succeed Battleford as the territorial capital" but "lost out to Regina ... in 1882". The name Fort Qu'Appelle was given to a number of trading posts in the Qu'Appelle valley. Near Fort Espérance both the Hudson's Bay Company and the North West Company had temporary posts that were apparently called Fort Qu'Appelle. (The Hudson's Bay Company and the North West Company merged in 1821.) From 1855 until 1864 the Hudson's Bay Company had a Fort Qu'Appelle a little south of McLean, Saskatchewan. It was an outpost of Fort Ellice and was mainly a source of pemmican. In 1864 it was moved to the present site of Fort Qu'Appelle. Three industrial boarding schools for First Nations adolescents were established in 1883, including one on the south side of Mission Lake across from Lebret on the north side of the lake, as well as Battleford and High River. It was often claimed that colonial administration of Canada, once "British North America", was very different from that in other British colonies. But it has been alleged to have been corruption on the part of Edgar Dewdney when he was Lieutenant-Governor of the North-West Territories to place the capital in Buffalo Bones rather than Fort Qu'Appelle or Qu'Appelle. On the other hand, Fort Qu'Appelle is strikingly similar to Murree, northeast of Rawalpindi and once the summer capital of British India, and Maymyo, Burma highlands. It was in 1915 that "Sir Robert Borden has been invited by the Saskatchewan Art Society to unveil a memorial at Ft. Qu'Appelle to the signing of the first treaty in 1874 between the Dominion and the plains Indians." The site of the fort was designated a National Historic Site of Canada in 1953. Fort bank circa World War I. Donald H. McDonald, whose name is on the building, was the last Hudson's Bay Company factor until 1911. Presently it serves as the Town of Fort Qu'Appelle Office and Council Chambers. The town's substantial growth beyond its status as a Hudson's Bay Company "factory" first occurred in the 1880s and 1890s when European settlement began in the region as the Canadian Pacific Railway moved westwards: a post office opened in 1880. This coincided with the first development of British India after the seizing of control of India from the East India Company by the Crown after the 1857 Indian Mutiny, and the town of Fort Qu'Appelle's striking similarity to the Indian hill stations of the early Raj has been widely commented upon by anyone who has seen both. Although the North-West Mounted Police headquarters was established in Regina once it was named capital of the North-West Territories in 1882, the substantial police station at the western end of the town of Fort Qu'Appelle remained significant as centre of service within the valley and in rural communities and to farms in the plains region: this became more important though less as nearby towns declined from the beginning of the Great Depression in 1929 and continuing after World War II. Older residences and commercial premises together with the town's Anglican and United (formerly Presbyterian) churches are quintessentially of the 19th century hinterland British Empire, a matter which local civic boosters and cultivators of tourism appear not yet to have capitalised upon. "In 1913, construction began on a fish culture station near Fort Qu’Appelle and, to date, the facility has supplied more than 2 billion fish to stock water bodies throughout the province....[T]he Fort Qu’Appelle Sanatorium (Fort San) for tuberculosis patients...[opened in] 1917." The ample commercial shops were substantially busier than merely for town residents, being grocery and supply centres for the ample number of farms; the Fort Hotel of the early 20th century through the 1960s had a well-attended pub with its parking lot full late Friday afternoons through evenings. A large drive-in movie theatre stood on Bay Avenue south of the railway track just before the entry into the coulee on Highway 36 to leave the valley; it had lively attendance by townspeople, cottagers and farmers until the 1960s when home television significantly improved and the drive-in closed. Despite the accelerating decline of rural Saskatchewanian population in the post-World War II years as farms needed to be larger and therefore fewer in number for economic viability, the town grew through most of the 1950s and 1960s as a cottage community serving the Qu'Appelle Lakes summer-cottage country in the valley up- and down-river from the town. Cottagers from Regina and other southern Saskatchewan communities used Fort Qu'Appelle as a base from which to explore the scenic and historic river valley, purchase hardware and groceries and contract services; the town also benefited urban drift as farms and other towns steadily depopulated. This process was precipitately accelerated in the early 1960s. Highway 35 had reached Fort Qu'Appelle by branching off the Trans-Canada Highway at the once-significant town Qu'Appelle and somewhat laboriously proceeding into the Qu'Appelle Valley by winding through an un-occupied coulee. The old highway was supplemented and effectively replaced by Highway 10, leaving the Trans-Canada at Balgonie and taking a straight route from the plain into the valley. This vastly eased access from the southwest and increased Fort Qu'Appelle's attraction over other market-places for farmers. 19th-century country school building elsewhere shown while still in use; here photographed in 1970, seven years after closure of successor across the road, from site of teacher's residence: demonstrating steady depopulation of farm neighbourhoods. In 1963, with steadily decreasing density of farm neighbourhood populations and increasing quality of highways, the rural school districts were abolished and farm primary and high school children—taught in one building with one or two classrooms—were thereafter bused to town schools. Rural churches having largely closed in the 1950s, the collapse of rural farming communities was now assured, to the benefit of minor metro-poles such as Fort Qu'Appelle though arguably to the impoverishment of the community as a whole. With the building of Highway 10 making access to Fort Qu'Appelle from outside the valley easier and faster, the process of farmers using it rather than previously substantial towns such as Qu'Appelle, Edgeley and Balcarres for selling grain and buying groceries further increased its size and vitality. The town itself is today "a shopping, service, and institutional centre serving the surrounding [f]arming community, neighbouring resort villages, cottagers and summer vacationers." Many traditional lake summer cottages have become year-round residences, together with winter skiing further expanding demand for the town's shopping facilities. Dr. Maurice Macdonald Seymour, Commissioner of Public Health, was a physician and surgeon of the early North-West Territories in Canada. [B] He founded the Saskatchewan Anti-Tuberculosis League which incorporated and constructed the Fort Qu'Appelle sanitarium. This tuberculosis sanatorium was operated by the provincial department of public health under the direction of Dr. R.G. Ferguson and opened in 1917 at nearby Fort San; when tuberculosis ceased to be a public health problem the facility was turned into a fine arts complex where a substantial summer program was operated 1967-91 when the provincial government terminated its funding: latterly it has become a resort village housing the Echo Valley Conference Centre. In addition to the ample summer lake cottages—in later years many occupied throughout the year—and the successive uses of the former Fort San tuberculosis, for many years the Regina YMCA operated a summer camp on the north shore of Echo Lake just west of Fort San; the Anglican Church continues to maintain a similar summer camp on the south shore of Mission Lake the other, east side of the town. The former Fort Qu'Appelle Indian Hospital was replaced in 2004 by the All Nations Healing Hospital. The hospital is one of the first health care facilities in Canada owned and operated by First Nation governments. There are sixteen in total, five from Touchwood Agency Tribal Council and eleven from File Hills Qu'Appelle Tribal Council. The surrounding area both north and south but also to minor extent within the valley is site of grain and cattle farms, nowadays larger in size and smaller in number and population than in past years, small rural communities and sixteen Indian reserves. 1892 first Springbrook School building (second and longer-used building erected in the 20th century, copies of this photo held in the Hudson Bay museum in Fort Qu'Appelle as well as numerous newspaper prints and copies held by former residents of the rural neighbourhood. The town has one high school, Bert Fox Community High School, and one elementary school, Fort Qu'Appelle Elementary Community School. The former Central School, built in 1911, was converted to the Qu'Appelle Valley Centre for the Arts. Parklands College is located at the Treaty 4 Governance Centre. Schooling in Fort Qu'Appelle radically expanded immediately after the end of academic year 1962-63 when close-by rural schools, which had pupils from kindergarten to grade 12, universally closed and their attendees were thereafter driven for school to the Fort. Such element in school pupils and students vastly diminished in subsequent decades, however, as farm population steadily declined. From 1967 through 1991 the closed tuberculosis sanatorium at Fort San was the location of the Saskatchewan Summer School of the Arts covering dance, music, visual art, writing and theatre. This drew a great many summer visitors to Fort San but also Fort Qu'Appelle and Lebret, whose Sacred Heart Roman Catholic Church was site for liturgical music presentations; the School of the Arts closed due to elimination of provincial government funding. Pre-World War I photo of St Andrew's Presbyterian (United since 1925) Church with next-door manse on Bay Avenue, immediately across side-street from St. John the Evangelist Anglican, also on Bay Avenue. Churches with long histories by local standards survive in nearby Lebret’s Sacred Heart Roman Catholic Church; St. John the Evangelist Anglican, being today’s heir of the 1854 Church of England mission (Anglican Camp Knowles on Mission Lake continues to operate in summers); and St. Andrew's United Church (Presbyterian until mid-1925). As in many if not most Canadian communities, church attendance in all traditional denominations has significantly declined, certainly in the Roman Catholic, United, Anglican and Lutheran churches, being the first- through fourth-largest Christian denominations in Canada. But the historic church buildings are nonetheless supplemented latterly by the more recently constructed Our Lady of Sorrows Roman Catholic Church, Our Saviour Lutheran Church, and the more recently arrived denominations' Valley Alliance Church and Kingdom Hall of Jehovah’s Witness. Once-thriving rural United Churches survived until the 1950s but closed when farmers' regular access to town increased and more fundamentalist at-home meetings acquired some favour. Fort Qu'Appelle has a semi-arid, highland continental climate with dry winters and cool summers (Köppen climate classification BSk), Fort Qu'Appelle's winters can be uncomfortably cold; but warm, dry Chinook winds routinely blow into the city from the Pacific Ocean during the winter months, providing the occasional break from the cold especially during the times of El Niño-Southern Oscillation. These winds have been known to raise the winter temperature by up to 15 °C (27 °F) in just a few hours. Fort Qu'Appelle is a town of extremes, and temperatures have ranged anywhere from a record low of −47.2 °C (−53 °F) on 12 January 1916 to a record high of 44.4 °C (112 °F) on 5 July 1937. The closest weather station recording historic climate temperatures is at Qu'Appelle, 27.28 kilometres (16.95 mi) south south-east on Highway 35. According to Environment Canada, the average temperature in Qu'Appelle ranges from a January daily average of −14.2 °C (6.4 °F) to a July daily average of 18.5 °C (65.3 °F). As a consequence of Fort Qu'Appelle's relative dryness, summer evenings can be very cool, the average summer minimum temperature drops to 10.6 °C (51.1 °F). Fort Qu'Appelle has a semi-arid climate typical of other cities in the Western Great Plains and Canadian Prairies. Fort Qu'Appelle receives an average of 455.4 mm (17.93 in) of precipitation annually, with 342.5 mm (13.48 in) of that occurring in the form of rain, and the remaining 111.9 mm of precipitation as 113.0 cm (44.5 in) of snow. Most of the precipitation occurs from May to August, with June and July averaging the most monthly rainfall. Droughts are not uncommon and may occur at any time of the year, lasting sometimes for months or even several years. The Mission Ridge Ski Hill, located just south of the town near the Treaty 4 Grounds, is open during the winter and is patronised by ski-enthusiasts from the valley and environs and from Regina and elsewhere in the region. On the July long weekend Mission Ridge plays host to Rockin' the Ridge, a one-day country/rock music festival. Recently, Fort Qu'Appelle and area were host to the 2007 Keystone Cup during April 12–15. The Keystone Cup is the Junior "B" ice hockey championship and trophy for Western Canada. The home town host, Fort Knox hockey club, placed 2nd and won the silver medal in the event. The town accommodated players, coaches, parents, and fans during the event. "The Fort Qu'Appelle Falcons, a midget-level team made up of 16- and 17-year-olds," finished the 2008-2009 season in first place and without any major infractions. The Fort Qu'Appelle Senior C team brought home the Jack Abbott Memorial Trophy in 1957, 2004 saw the Fort Qu'Appelle Flyers win the Female Pee wee A provincial championship. In 2004 and 2005, the fort Qu'Appelle Falcons Midge A team earned the Harold Jones Cup, 2006 saw the Female Bantam A team, the Fort Qu'Appelle Flyers rise to provincial championship level, and in 2007 provincial champions arose from Fort Qu'Appelle again when the Falcons Bantam A team achieved the honour of the John Maddia Cup. Starting his career in 1970-71 with the Fort Qu'Appelle Silver Foxes, Glen Burdon was selected in both the National Hockey League and the World Hockey Association drafts. The Fort Qu'Appelle curling club was established 1894. the first rink was north of the Canadian Pacific railway line on Boundary Avenue North with one sheet of ice. The curling club competed with Lebret and the Sanitorium clubs during the 1940s. The curling club expanded in 1947 moving the Dafoe air force hangar into town. Fort Qu'Appelle Sioux Indians belonged to the Southern Baseball League. In 1961, Duane Ring of the Fort Qu'Appelle Sioux Indians was runner up for the hitting crown. He fell just .057 percentage points behind Lionel Ruhr. Fort Qu'Appelle and nearby Qu'Appelle Valley sites have almost from the beginning of township provided ample recreational sites and are a notable tourist destination both in summer and winter. "[I]in the years prior to World War I ...the recreational potential of the district began to be exploited and numerous cottages began to appear on the area lakes." The lakes afford swimming, boating and other water related activities in summer and cross-country skiing, snowmobiling and ice fishing in winter. There is also Echo Valley Provincial Park located between Echo Lake and Pasqua Lake. The park provides an RV park, camping, swimming, boating and fishing. "To the visitor, southern Saskatchewan Qu'Appelle Valley might, at first glance, appear to be a mirage. Bordered by seemingly-endless farmland flatness, the dramatic physical features of the valley appear somewhat out of place. The long-closed railway station was originally of the Grand Trunk Pacific Railway, "incorporated in 1903 as a subsidiary of the Grand Trunk Railway" and "[b]y 1923, [with] the Grand Trunk Railway, and the National Transcontinental merged with the Canadian Northern Railway to form the new Canadian National Railway." "[M]any prairie branch lines closed after 1945; the passenger service was terminated in 1978." immediately to the west of Fort Qu'Appelle, approximately halfway along the south shore of the lake; a popular holiday resort and commuter community since the 1880s. The Grand Trunk Pacific Railway station nonetheless continues to stand, maintained as a site for current information on attractions and activities. After closure as a medical facility, Fort San was used as a summer musical facility until the 1990s with choir concerts in the nearby Sacred Heart Roman Catholic Church in Lebret. The most notable tourist event is Treaty 4 Gathering, is a week-long event celebrating the signing of Treaty #4. The event is held in September, during the week of the 15th. Pow-wows are held daily during the week. See below as to past participation in such events by the perhaps most world-famous person of local origin, 1960s folksinger and activist Buffy Sainte-Marie. Aforementioned winter downhill ski-ing, currently at the Mission Ridge Ski Hill, attracts ski-ers not only from the town but elsewhere in the region including the city of Regina. Hockey star and Hockey Hall of Fame member Eddie Shore was born in Fort Qu'Appelle. 1960s folksinger and activist Buffy Sainte-Marie was born on the Piapot Cree reserve in the Qu'Appelle Valley. James Henderson, "Saskatchewan’s pre-eminent first-generation artist" spent much of his career working in Fort Qu'Appelle. Walter Dieter (Peepeekisis First Nation), the founding chief of the National Indian Brotherhood in 1968, which is today known as the Assembly of First Nations. Noel Starblanket (Starblanket First Nation), the third chief of the National Indian Brotherhood. The town's community newspaper the Fort Qu'Appelle Times, as of January 2014, is now released every Friday whereas it was previously released on Tuesday. The town has 3 television re-transmitters. The transmitters are used by CBC (channel 4), Global (channel 6), and CTV (channel 7). The CBC movie Betrayed was filmed primarily in Fort Qu'Appelle, with notable sites including the old hospital (both in and out). The television series Life Without Borders is filmed and produced in the Fort Qu'Appelle area. ^ McLennan, David. "Fort Qu'Appelle". Encyclopedia of Saskatchewan. Retrieved 18 June 2012. ^ "Fort Qu'Appelle, SK". Google Maps. Retrieved 2007-08-12. ^ McLennan, David (2006). "Fort Qu'Appelle". The Encyclopedia of Saskatchewan. CANADIAN PLAINS RESEARCH CENTER, UNIVERSITY OF REGINA. Retrieved 2008-04-15. ^ Redekopp, Dale (1999–2006). "Praying Indian Fort Qu'Appelle, Saskatchewan". LARGE CANADIAN ROADSIDE ATTRACTIONS. Archived from the original on 2007-11-09. Retrieved 2008-02-15. ^ "2016 Community Profiles". 2016 Canadian Census. Statistics Canada. February 21, 2017. Retrieved 2017-06-19. ^ "2011 Community Profiles". 2011 Canadian Census. Statistics Canada. July 5, 2013. Retrieved 2012-08-11. ^ Garth Pugh. "Fort Qu'Appelle". The Canadian Encyclopedia. Accessed 1 March 2012. ^ The American magazine. 22. Crowell-Collier Pub. co. 1886. pp. 525–526. Suddenly, the prairie road stopped short, and, 400 feet below us, we saw the beautiful Qu'Appelle Valley, with its four shining lakes, and the winding river connecting them, and on either hand the echoing hills. No wonder it is named Qu'Appelle 'the valley that calls'; the hills are formed in strange winding shapes, in cones and pyramids and serpent-like forms that catch each sound, and sent it back and forth across the placid water. Some hills look like great walruses and seals, with their smooth brown backs glistening in the sun; upon others, a light growth of trees, now gorgeous with the Autumn colors, follow the lines of the ravines and coulees. We drive down the valley where the little settlement of Fort Qu'Appelle lies; past the stockade of the Hudson Bay Company, which incloses the warehouses and the residence of the chief factor, Archie McDonald; over the little bridge, and past the second of the lakes, four miles to the Government School. ... The buildings of the mission stand on the shore of the lake, and only a short distance from the school. In 1866 Father Ritchot traveled from Winnipeg by dog-train for the purpose of founding this mission, and from that time to this the Fathers have worked faithfully among the Indians and half-breeds. ... the mission buildings consist of the monastery, a little church, a house for the farm-hands, and for cooking purposes, stables, old store-houses, and a great oven made of clay. ... Back of the monastery is the Indian graveyard; some of the graves are marked simply by a rude wooden cross, but many have singular structures of wood, resembling Chinese pagodas, over them; these are painted black with strange decorations in white painted on them, such as 'polka dots', bands and stripes, and there was one with great white drops to represent tears. ^ Leggo, William (1878). "Treaty of Qu'Appelle - No. 4 in September 1874 - "Who Calls" - Indian Tradition - Account of proceedins at Fort Qu'Appelle". The history of the administration of the Right Honorable Frederick Temple, Earl of Dufferin ... late Governor General of Canada. Lovell Print. & Pub. Co. The Council at Fort Qu'Appelle, a Hudson Bay trading post, at the junction of the Qu'Appelle and Assiniboine, was composed of representatives of the Plain Crees and Salteaux nations. ^ Norm Henderson, "Qu'Appelle Valley". The Encyclopedia of Saskatchewan. http://esask.uregina.ca/entry/quappelle_valley.html. Retrieved December 1, 2012. ^ Peter Borch, Daria Coneghan, "French’s Scouts," The Encyclopedia of Saskatchewan. http://esask.uregina.ca/entry/frenchs_scouts.html. Retrieved January 18, 2013. ^ McLennan, David. "Qu'Appelle". The Encyclopedia of Saskatchewan. CANADIAN PLAINS RESEARCH CENTER, UNIVERSITY OF REGINA. Retrieved 2007-07-13. ^ Garth Pugh. "Fort Qu'Appelle". The Canadian Encyclopedia. Historica-Dominion. Retrieved 16 March 2012. ^ Blair Stonechild. "Aboriginal Peoples of Saskatchewan". The Encyclopedia of Saskatchewan. Retrieved December 1, 2012. ^ "Qu'Appelle Memorial". The Christian Science Monitor. Google News Archives. Oct 23, 1915. Retrieved 2013-02-10. ^ CANADIAN PUBLICITY.CO Publishers (2005-07-25). "Pioneers and Prominent People of Saskatchewan - SGW transcription project". SEYMOUR: Maurice MacDonald, M.D. Adamson, Julia E. Retrieved 2009-03-21. ^ CANADIAN PUBLICITY.CO Publishers (2003-01-06). "Saskatchewan Gen Web Project - Saskatchewan and Its People by John Hawkes Vol III 1924". Maurice MacDonald Seymour, M.D., C.M., D.P.H. Fellow Royal Institute Public Health, England Fellow American Public Health Association. Adamson, Julia E. Retrieved 2009-03-21. ^ "Maurice Macdonald Seymour (1857-?)". Manitoba Historical Society. 2002–2009. Retrieved 2009-03-22. ^  Retrieved 8 January 2012. ^ "One-room Schools in the Fort Qu'Appelle Area." http://www.fortquappelle.com/hist_m11.html January 18, 2013. ^ "SASKATCHEWAN SUMMER SCHOOL OF THE ARTS (Encyclopedia of Saskatchewan)". University of Regina. Retrieved 2011-03-06. ^ Archdiocese of Regina : a history (digitize online by Our Roots / Nos Racines). Regina, Saskatchewan: Archdiocese of Regina. 1988. pp. 261–262. Fort Qu'Appelle was built about 1852 by the Hudson's Bay company as an outpost of Fort Ellice ... On 27 August 1864 Bishop Tache of St. Boniface celebrated the first mass in Fort Qu'Appelle, ministerd to the Catholics at the post.... the bishop returned to Fort Qu'Appelle in October 1865 and chose a site for a Catholic mission four miles east of Fort Au'Appelle. The following year Rev. Norbert Ritchot came to build a house-chapel and administer the sacraments. ^ Fung, Ka-iu; Barry, Bill (1999). Atlas of Saskatchewan (Celebrating the Millennium ed.). Saskatoon, SK: University of Saskatchewan. p. 95. ISBN 0-88880-387-7. ^ a b "Daily Data Report for January 1916". Canadian Climate Data. Environment Canada. 22 September 2015. Retrieved 29 June 2016. ^ a b "Daily Data Report for July 1937". Canadian Climate Data. Environment Canada. 22 September 2015. Retrieved 29 June 2016. ^ a b c "Qu'Appelle 1". Canadian Climate Normals 1981-2010. Environment Canada. 22 September 2015. Retrieved 8 May 2016. ^ "Fort Qu'Appelle". Canadian Climate Data. Environment Canada. 22 September 2015. Retrieved 29 June 2016. ^ Weidlich, John (February 11, 2009). Sask. hockey team plays clean, and cleans up in league play Fort Qu'Appelle Falcons did not fight all season long. CBC News. Retrieved 2012-09-03. ^ Saskatchewan Hockey Association - Past Provincial Winners. Saskatchewan Hockey Association. 2007–2012. Archived from the original (Website by Look Matters) on 2010-06-27. Retrieved 2012-09-03. ^ Argan, William P (1991). "Fort Qu'Appelle Goes It Alone". Saskatchewan curling : heartland tradition. Regina, Saskatchewan: Saskatchewan Curling Association. ^ Gent, Doug (May 7, 2011). Estevan Maple Leaf Baseball team. ^ Western Canada Baseball 1961. JDM. 2010. ^ David McLennan, "Fort Qu'Appelle." The Encyclopedia of Saskatchewan. http://esask.uregina.ca/entry/fort_quappelle.html August 20, 2012. ^ "Qu'Appelle valley is big attraction for visitors". The Leader-Post. Google News Archive Search. June 23, 1959. Retrieved 2013-02-10. ^ Clancy, Michael T.; Anna Clancy (2006). Anna Clancy, ed. A User's Guide to Saskatchewan Parks. CPRC Press. 5 of Discover Saskatchewan Series (illustrated ed.). University of Regina. Canadian Plains Research Center. ISBN 9780889771987. Retrieved 2013-02-10. ^ Peterson, Bill (June 12, 1978). "Qu'Appelle Covered in Book". The Phoenix. Google News Archive Search. Retrieved 2013-02-10. ^ "Shore's Latest Holdout Ends. N.H.L. maximum of %$7,000 announced as his salary for 1938-9 season: No penalty for missing first four games" (digitised online by Google news). Windsor Daily Star. Nov 16, 1938. Retrieved 2012-07-03. ^ "Eddie Shore Recovering From Illness". Ottawa Citizen. Google News Archive Search. Oct 5, 1960. Retrieved 2013-02-10. ^ James E. Lanigan, "James Henderson," Encyclopedia of Saskatchewan. Retrieved 19 November 2007. ^ "Canadian Art Receives Impetus with Opening of Ottawa exhibition - Landscapes by James Henderson of fort Qu'Appelle and G. Kenderdine, are worthy of note, other westerners contribute" (digitised online by Google news). Canadian Press. Saskatoon Star Phoenix. January 29, 1931. Retrieved 2012-07-03. ^ 1981–2010 normals are from Environment Canada's closest climate station, located at nearby Qu'Appelle. Extreme high and low temperatures were recorded at Fort Qu'Appelle from 1912 to 1972. A time-table with notes of the transcontinental trains, the Great Lakes route, and the Halifax, St. John and Montreal, and the Montreal and Toronto lines (digitised online by Google news). Canadian Pacific railway company. July 21, 1930. Retrieved 2012-07-03. A good road extends northward [from Qu'Appelle] to Fort Qu'Appelle, the Touchwood Hills and Prince Albert. Fort Qu'Appelle, 20 miles distant, is an old post of the Hudson's Bay Company, beautifully situated on the Fishing Lakes in the deep valley of the Qu'Appelle River. There are several Indian reservations in its vicinity, and an important Indian mission. "Compline Bell Provides Biggest Upset at Track ~ Fort Qu'appelle stable's imported mare noses out Bon Bobby to Pay $72,95 on $2 Ticket" (digitised online by Google news). Saskatoon Star Phoenix. July 21, 1930. Retrieved 2012-07-03. "In stables here Euphrosyne" (digitised online by Google news). Saskatoon Star Phoenix. July 21, 1930. Retrieved 2012-07-03. "Euphrosyne with Sammy Baird up, one of the fastest sprinters on the Western Canada fair circuit, which will likely be sent to the barrier on Wednesday. Euphrosyne is owned by Capt. Stan Harrison of Fort Qu'Appelle stables and is a stable mate of the imported mare, Compline Bell, who furnished the big upset at the track yesterday. "Lord Dawson Honored by Cree Indians; Made Chief" (digitised online by Google news). Saskatoon Star Phoenix. Canadian Press. August 28, 1930. Retrieved 2012-07-03. Macoun, Jack (1883). Manitoba and the great Northwest:the field for investment; the home of the emigrant (digitised online by Google news). T.C Jack. Retrieved 2012-07-03. An attack was made on Fort Qu'Appelle near where Fort Ellice now stands, which proved unsuccessful, Mr. Alexander Mackenzie, the gentleman in charge, beating off the attacking party. Masson, David; Sir George Grove; John Morley; Mowbray Morris (1885). Macmillan's magazine Volume 52 (digitised online by Google books). Macmillan and Co. Retrieved 2012-07-03. Leaving the station the trail goes northward to a trading post of the Hudson's Bay Company called Fort Qu'Appelle, at the head of a region famous for its beautiful lakes. Here there is a considerable settlement, with a mixed population of whites and Half-breeds, but beyond it, with the exception of a few homesteads thinly scattered over the Touchwood Hills some thirty miles from Fort Qu'Appelle, the long lines of the prairie are only broken at wide intervals by the solitary shanties at which the Saskatchewan stages stop on their way northwards. This page was last edited on 29 January 2019, at 19:39 (UTC).